Freshwater Pearl & Garnet Necklace. 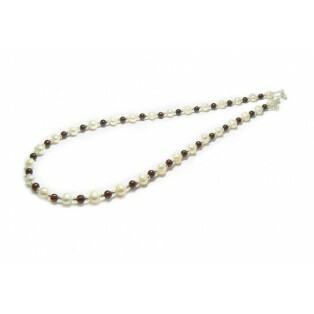 Rich, majestic, garnet and exquisite white freshwater pearl necklace. Finely crafted especially for the glamorous lady that is passionate about pearls. An ideal gift for that special person you love. Freshwater Pearls are cultured by the fish farmers in the freshwater lakes of China. They take a particle from a pearl molusc and transfer it into a host shell where it will be left to live and grow for some time. After havesting the pearls are graded for size, colour and quality before being sold. Energizing, inspiring transluscent reddish brown garnets together with pure white freshwater pearls are a mixture made with love. This necklace is 18" (46cm) long and I have added a silver plated (Nickel Free) clasp and extension chain to comply with EU directives.